Groupama completed a massive comeback to beat arch-rivals Telefónica to the final podium position of Leg 6 by 37 minutes, leaving the Volvo Ocean Race poised on a knife-edge with just 17 points splitting the top four boats. Franck Cammas’ French team overcame a slow start to oust Telefónica, their closest rivals on the overall leaderboard, from third position in the final few days of the 4,800-mile race from Itajaí, Brazil, to Miami in one of the most compelling duels of the 2011-12 event. The leg was won late on Wednesday by PUMA Ocean Racing powered by BERG, with CAMPER with Emirates Team New Zealand taking second. Telefónica now sit at the top of the leaderboard with 164 points. Second, third and fourth positions are split by just six points with Groupama on 153, CAMPER on 149 and PUMA on 147. "I’m very happy to finish in front of Telefónica," said a relieved Cammas. "The fight with them was very good for two days. 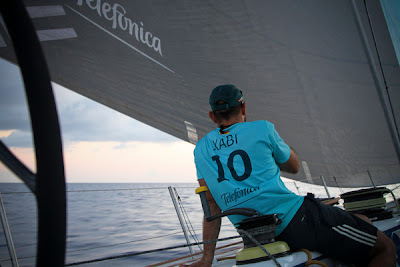 "It was very good for the spirit of the crew to fight against Telefónica -- we gained five points on the overall leaderboard and this is very good. It’s very exciting now to have this close fight between four boats." The victory over Telefónica was all the more sweet for Groupama who carried it off with a new rig after they dismasted 500 miles from the Leg 5 finish while in the lead. Adjusting to the new set-up initially hampered progress and Groupama found themselves fighting their way out of fifth place while Telefónica challenged for the lead, but clever sailing through the Caribbean saw Cammas’ men shoot through the rankings to third as Telefónica, skippered by Spaniard Iker Martínez, fell foul of light winds. Once into third, it was a position Groupama never relinquished, crossing the finish line in Miami at 00:29:04 UTC on Thursday, 20:29:04 local time on Wednesday in Miami. With three offshore legs and four in-port races still to sail, Telefónica’s control of the overall leaderboard is now under threat heading into the PortMiami In-Port Race and Leg 7 from Miami to Lisbon, Portugal. "It wasn’t a good result, we’re not happy at all," said Martínez. 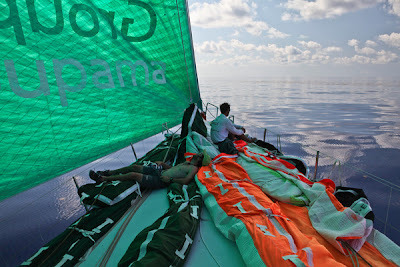 "It was the first time we did an offshore leg and didn't get a result. We knew this would happen at some point and it happened in Leg 6. "We didn’t manage the situation with these leg wins very well and we’ve paid a big price. But that’s it, we’ve finished, and now we have to think about the future." Telefónica were a consistent threat to PUMA and CAMPER at the head of the fleet for the majority of the leg until they came undone in fickle winds east of the Turks and Caicos Islands. Groupama took a gamble going west of the islands and it paid, sending them straight into third place and leaving Telefónica playing catch-up. Try as they might, Martínez’s crew couldn’t catch their French rivals and had to settle for fourth place at 01:06:39 UTC, the first time they have failed to finish on the podium in an offshore leg. The results mean that all four top boats will enter the transatlantic Leg 7 with a realistic chance of winning the Volvo Ocean Race 2011-12. Abu Dhabi Ocean Racing were set to take fifth place and 10 points with an estimated time of arrival into Miami of 0700 UTC on Thursday.